Algonquin Park is a fascinating place to visit in the winter. For many visitors the deep snow, ease of viewing wildlife, and the vast solitude of Algonquin Park's ski trail network and backcountry are appealing. Algonquin Park is open year-round but facility dates and hours of operation vary during the winter months (November to late March/April). Park permits are required during winter. Daily Vehicle Permits are available at the West Gate, Visitor Centre, and East Gate during normal hours of operation. See the Events Calendar for operating dates and times. If permit offices are closed, please use the self-serve "pay and display machines" at the West Gate or East Gate to obtain your permit. For safety reasons, no permits will be issued within one hour of sunset. Permits are valid from 7:00am to 10:00pm. After obtaining your permit, ensure it is displayed on your vehicle's dashboard at all times while in Algonquin Park. For overnight camping permits in either Mew Lake Campground (developed camping) or the Park's backcountry, see the relevant links below. In situations where little time has elapsed since the last snowfall, visitors may experience deep snow conditions in normally plowed areas. Visitors attempting to drive into deep snow conditions should use caution and travel with necessary emergency equipment to free their vehicle without assistance from Park staff. Ploughing in Algonquin Park is done on a priority basis, as staff time permits. For more preparedness information see "Winter Safety" below. 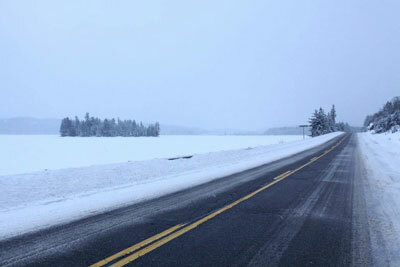 Visitors wishing to drive a side road off Highway 60 are encouraged to travel the Opeongo Road (north from km 46.3) which is plowed to the winter gate at the Cameron Lake Road. This narrow road with good wildlife viewing opportunities has limited winter turn-arounds and no shoulders – drivers should use caution. From mid-October to mid-May, commercial services are available only outside the Park, this includes accommodation, dining, and outfitting services, plus gasoline and car repair. Visitors should obtain services in Whitney and beyond to the east, and in Oxtongue Lake or Dwight and beyond to the west. The West Gate, which offers Park permits, information and bathroom facilities, operates on reduced hours during the winter months. Please see the exact operating dates and hours in the Events Calendar. The East Gate also operates on reduced hours, listed in the Events Calendar during winter. This facility offers permits, information and bathroom facilities. The Algonquin Visitor Centre is open year-round with full services on weekends from early November to late April (with extended operating dates during holiday periods) plus limited services on weekdays throughout the winter, see the Events Calendar for complete details. The Visitor Centre offers a Bookstore and Nature Shop featuring souvenirs plus outstanding exhibits on the Park's natural and cultural history. A theatre presentation sums up the Park story and takes you out to a viewing deck from which you can admire a breathtaking panorama of wild Algonquin landscape. The Visitor Centre also issues Park permits (day-use only, no camping permits) and provides Park information, plus bathroom facilities. A stop at the Information Desk to talk with Park staff is also a wise idea if you are in search of winter wildlife. Mew Lake Campground is the only developed campground open year-round. Please see "Developed Camping" below for more details. The Barron Canyon Road (access road to Sand Lake Gate) and associated parking lots such as the Barron Canyon Trail, McManus Lake Access Point, Lake Travers Access Point, etc. is not plowed in the winter by Ontario Parks. This includes the +/- 18 kilometres of road outside the Park. Road maintenance (ploughing and sanding) is performed by the forest industry to meet their needs, with no maintenance on weekends or holidays. As of March 22, 2019 winter road maintenance conducted by the forest industry has concluded on the Park's East Side. Visitors should avoid travel on roads during the spring melt. For winter road conditions on the Park's East Side (not Highway 60), contact Brent Frederick, Achray Group Leader, Ontario Parks at (613) 732-5553. The Achray Road is typically gated one kilometre from the (closed) Achray Campground from Thanksgiving (the second Monday in October) to late April and visitors must access the trails and the backcountry on foot from the gate. When winter's snow arrives, visitors wishing to access the Eastern Pines Backpacking Trail, Berm Lake Trail or the backcountry in the Achray area will have to snowshoe or ski about 5 km from the intersection of the Barron Canyon Road and the Achray Road, if the Barron Canyon Road is plowed (see above). Permits are required for all Park visits and are available at the self-serve fee station (cash only) at the Sand Lake Gate. 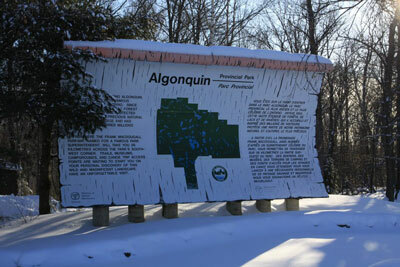 There is no cell phone coverage on Algonquin's East Side. Developed camping is available year-round at Mew Lake Campground with campsites #1 to 33 and the yurts reservable up to five months in advance through the centralized Ontario Parks Reservation Service. The remainder of campsites in Mew Lake Campground are available on a first-come, first-served basis. The main parking lot and the roads adjacent to campsites #1 to 76 are plowed, and sites #1 to 66 have electrical hook-ups. Sites are plowed as time and weather allow. First-come, first-served camping permits can be purchased at the West Gate or East Gate during operating hours on the day of your arrival (see the Events Calendar for operating dates and hours). If you are arriving at the Mew Lake Campground when offices are closed and you do not have a reservation, you may purchase your permit from the self-serve fee station located at the entrance to the Mew Lake Campground. Please note that the self-serve fee station takes cash only, so exact change is required. See fees and permits for pricing information. Payment by credit card for late arrivals is possible by calling and speaking with Park staff at 705 633-5572 the morning after your late arrival. During times when demand exceeds available campsites at Mew Lake Campground (such as potentially around Christmas/New Years, Family Day Weekend or March Break), Park staff may open the Lake of Two Rivers Campground for additional campsites. When this occurs heated bathroom facilities are only available at Mew Lake Campground for all campers. The Mew Lake Campground also features seven yurts (spacious tent-like structures with basic furniture and electric heat; available by reservation only) for those who would like a simple style of roofed accommodation. Reservations for Mew Lake Campground's yurts are taken up to five months in advance through the centralized Ontario Parks Reservation Service. 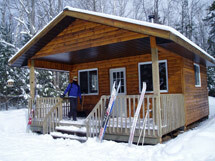 A fully-winterized comfort station (flush toilets, showers, and laundry facilities) is available at Mew Lake Campground. A skating rink is also available near the Mew Lake Campground comfort station for Park visitors (see below for more details). Skiing, snowshoeing, fat biking, hiking and winter camping is permitted on the Old Railway Trail that can be accessed from near the comfort station at Mew Lake Campground (see below for details). Firewood may be purchased at the Mew Lake Campground woodyard and is housed in a shed beside the woodyard gate. Place payment (cash only) in the fee box at the woodyard. All Ranger Cabins accessible by vehicle are closed for the winter and typically reopen in late April. For the adventurer, winter camping is permitted in the Park backcountry, accessible only by ski or snowshoe. For overnight backpackers, the parking lots for the Western Uplands Backpacking Trail and Highland Backpacking Trail are plowed. Procedures for permits and registration differ during Algonquin's winter period (Canadian Thanksgiving to the last Friday in April). During this period, winter backcountry camping is on a first-come first-served basis. The Ontario Parks Reservation Service Call Centre does not accept backcountry campsite reservations for the winter period. Permits can only be purchased at the West Gate or East Gate during office hours on the day of your arrival. 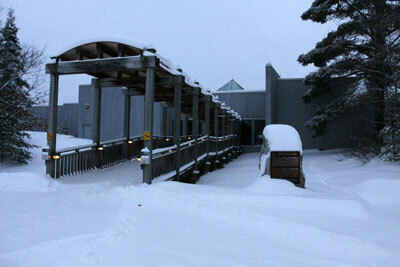 When the Gates are closed, you may call 705 633-5572 and speak with Park staff to obtain a permit using a credit card. For safety reasons, visitors must leave a note on the vehicle dash clearly indicating your name, destination, arrival and departure dates and the permit transaction number that will be given at the time of the booking. In the event of an emergency your trip details will be used as confirmation. When the ground is snow covered or lakes are frozen, winter backcountry camping is not permitted on designated summer campsites or within 30 metres of a lakeshore, trail, or portage marked on the Canoe Routes Map or Backpacking Trails Map. It is recommended that you camp in low sheltered areas where there is a good supply of standing dead firewood for warmth and cooking. All Ranger Cabins are closed for the winter and typically reopen in late April. Parking is available at most of the self-guided interpretive trails along Highway 60 during the winter months, however, regular trail maintenance takes place only from early May to late October. Guide booklets are removed from trailhead dispensers from late October to early May. During the winter trail guide booklets are available year-round at the East Gate, West Gate and the Visitor Centre, or online. The following interpretive trails have plowed parking lots or parking areas throughout the winter months. For safety reason, plan your trip and ensure you are off all interpretive trails prior to darkness. The Winter in the Wild Festival is a celebration of winter in Algonquin and highlights some of the season's best activities offered in the Park on Family Day Weekend (mid-February). 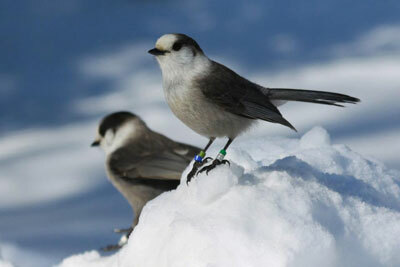 Events vary from year to year but often include guided bird walks, guest speakers, guided snowshoe excursions, skating, skiing, winter camping demonstrations, a special evening event, and hearty meals. All of the activities during the festival are free with the purchase of a Daily Vehicle Permit or Camping Permit with the exception of food. For full event details see Winter in the Wild Festival. Algonquin has 85 kilometres of groomed and 32 kilometres of non-groomed cross-country ski trails available in several trail networks. Trails range in degree of difficulty from easy to difficult. Ski trails typically open in December and close in March, but obviously are subject to weather conditions. Check the latest ski trail conditions to ensure you are prepared. To minimize damage to groomed ski trails (Fen Lake and Leaf Lake) dogs, walking, snowshoeing, toboggans and sleighs are not permitted on groomed ski trails. Skiing, snowshoeing, fat biking, hiking, winter camping plus toboggans and sleighs are permitted on the ungroomed Minnesing Ski Trail and the non-trackset portion of the Old Railway Trail. Winter equipment rentals (snowshoes, skis, camping equipment, etc.) are available only from outfitters located outside the Park during winter. There are no downhill skiing opportunities in Algonquin Park. Snowshoeing enthusiasts can go virtually anywhere (except the groomed ski trails). If you prefer to stay on marked trails, check out the interpretive walking trails or either of the two longer overnight backpacking trails. Algonquin's network of portages shown on the Canoe Routes Map also makes a great snowshoeing alternative - but ice travel is not recommended. The multi-use Old Railway Trail is a great snowshoeing location too. Many winter visitors enjoy observing the tracks of deer, Moose, martens, Fishers, otters, foxes and wolves and occasionally, the animals themselves. 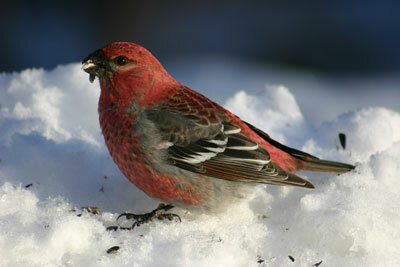 Birds such as the Common Raven, Gray Jay, Boreal Chickadee and colourful winter finches are also frequently seen. Check the latest winter birding report for what is being seen and where or stop by the Visitor Centre to talk with Park staff about wildlife watching. 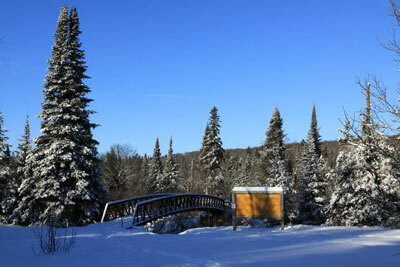 Walking the Spruce Bog Boardwalk Trail in search of northern bird species such as Spruce Grouse, Gray Jay, and Black-backed Woodpecker, or exploring the Opeongo Road are popular winter activities for birders and wildlife watchers. Another popular location for birds is the observation deck at the Visitor Centre. Dog sledding trails are found in two locations in Algonquin Park – one along Highway 60 and one in the northwest section accessible from the village of South River on Highway 11. Commercial operators offer dog sledding services and should be contacted directly for information or, if you wish to use the trails independently, contact the Park for detailed trail maps and permit information. A skating rink near the Mew Lake Campground comfort station is in operation during winters in Algonquin Park, as weather conditions permit. If you are coming to Algonquin Park pack your skates and hockey sticks. 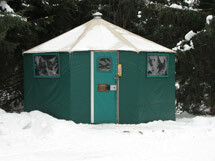 The Mew Lake Campground ice rink is located near the heated comfort station and has lights for evening skating, a campfire pit with wood, a hot tent for warming up and hockey nets. Please note that the ice rink may be closed by Park staff during periods of above freezing temperatures to preserve ice conditions. Check at the rink for important notices. Winter fishing is prohibited. Algonquin Park serves as a fish sanctuary from December to late April. See Fishing in Algonquin Park for more details. 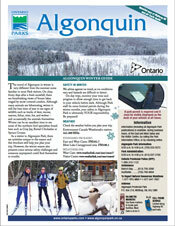 See Snowmobiling in Algonquin Park for more information on this topic. 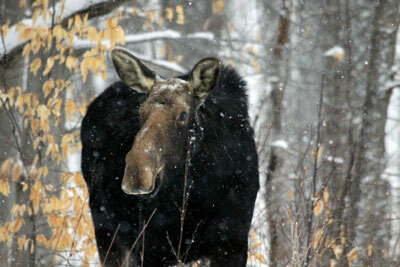 A visit to Algonquin in winter can be extremely rewarding, but there are dangers. On any visit to Algonquin Park, visitors must be aware of their limitations. Your safety in Algonquin Park – as elsewhere – is ultimately your responsibility. Be prepared! Winter camping requires special care and attention to equipment. On any trip it is wise to tell someone back home your exact itinerary and expected return date. Even following this advice and the fact that the Park staff do patrol the Park, it cannot be taken as assurance that you would be found in time if you were to become lost or have a serious accident in sub-zero temperatures. The Park advises against ice travel due to a range of environmental variables and the difficulty in detecting hazards. Be prepared for a cold-weather emergency. Cellular telephone coverage is not Park-wide; generally it is limited to 3 kilometres on each side of Highway 60 and, even in this area, service can be "none" to "limited."